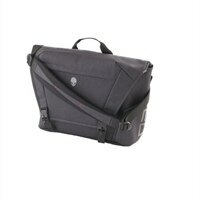 Alienware Area-51m Messenger - Laptop carrying case - 17.3-inch - black, dark grayAlienware Area-51m Messenger for the mobile gamer. Compatible with Alienware m15, m17, and Area-51m laptops. Alienware Area-51m Messenger has super easy to use front buckles. It is sleek and comfortable for everyday tasks. Alienware Area-51m Messenger for the mobile gamer. Compatible with Alienware m15, m17, and Area-51m laptops.